Marbleized Ornaments - Lovely Etc. These ornaments look so beautiful, but there was a bit of a learning curve with this project. 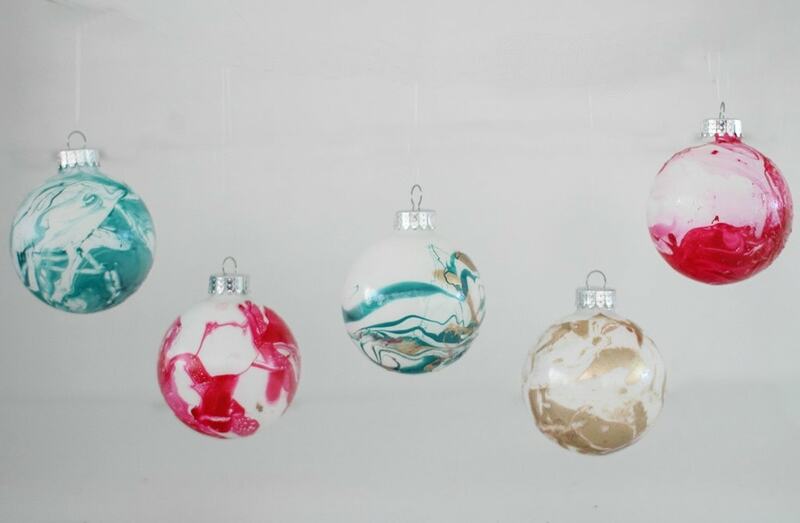 The thing that makes these ornaments so pretty is that the nail polish does its own thing – it may look sort of like paint, but it behaves nothing like paint in this project. 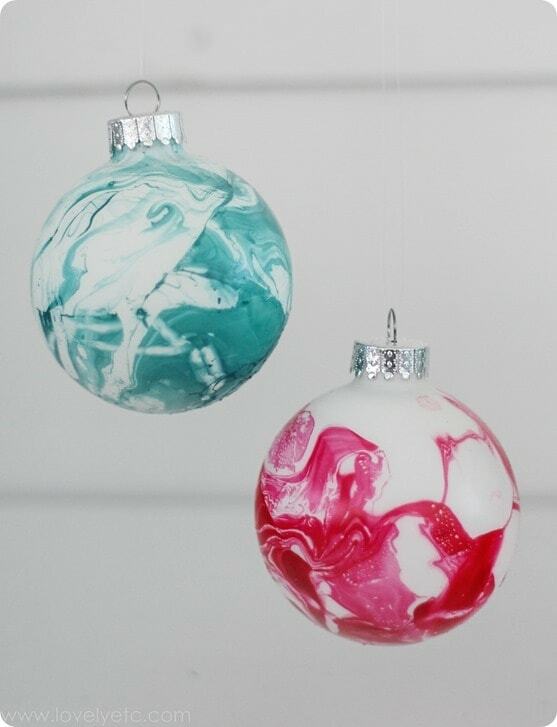 Yes, you could just swirl some paint around an ornament but it definitely isn’t going to look like this. 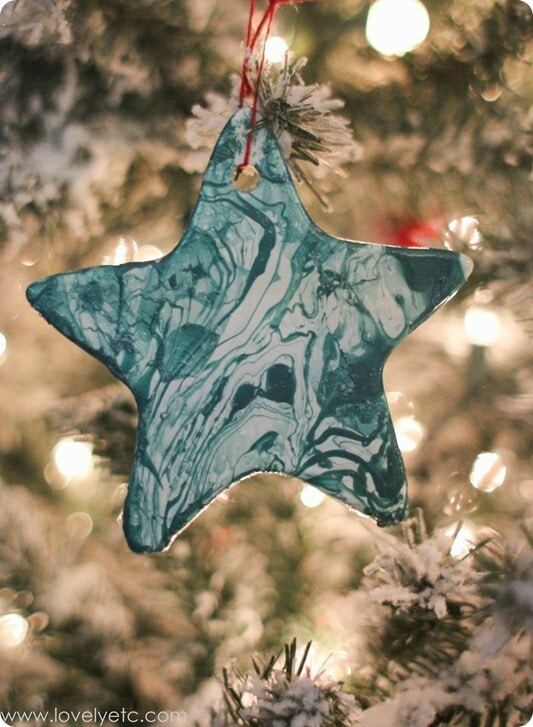 And while this wasn’t quite as simple as I had been led to believe, with a bit of trial and error and a few tweaks, I ended up with some really beautiful ornaments. Once I knew what I was doing, it really wasn’t difficult at all. White ornaments – I used porcelain stars and balls. 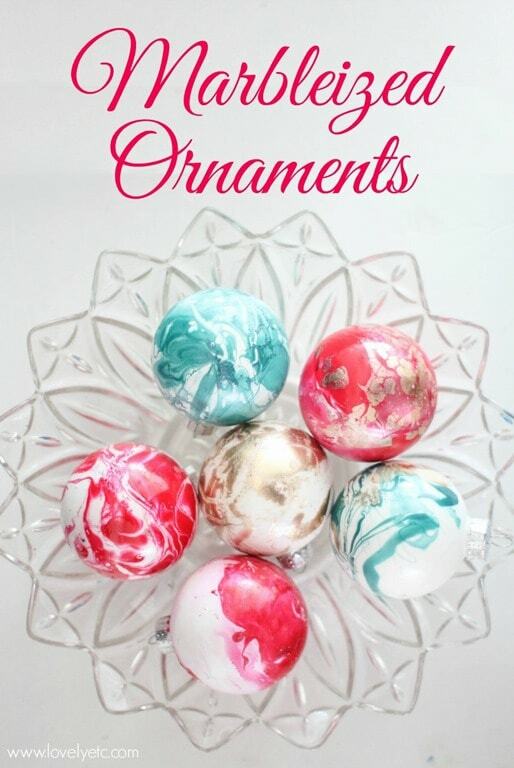 You could use glass ornaments as well. 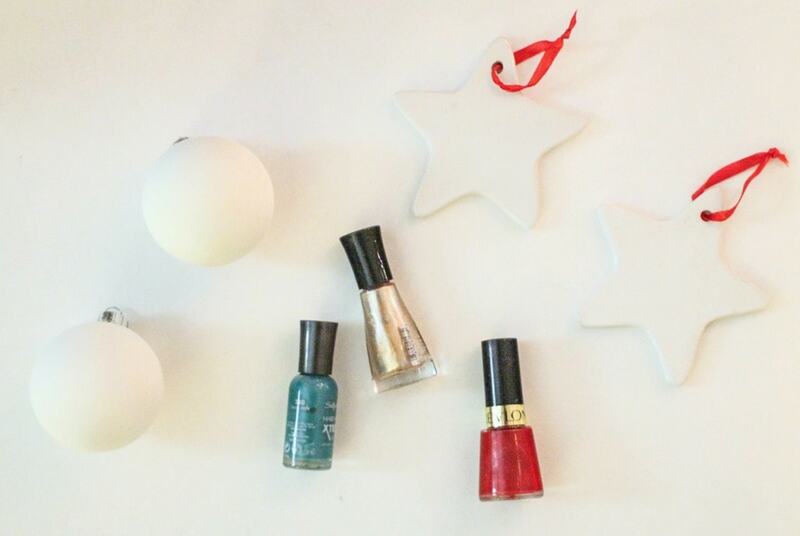 Nail polish in your chosen colors – no instant dry or quick dry! You need some sort of container to hold water. It needs to be something that is disposable because it will get ruined in this process. I ended up using an old tupperware bowl that had seen better days. Your container also needs to be bigger than you might think at first. It should be at least as deep as the object you are marbelizing and quite a bit bigger around. The color you see around the rim and at the bottom of the bowl are residue from previous ornaments I had already completed at this point. 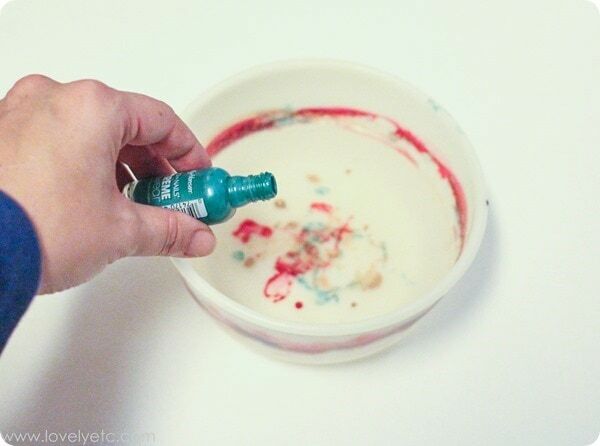 Add a few drops of colored nail polish to the container and then swirl them around with a toothpick. 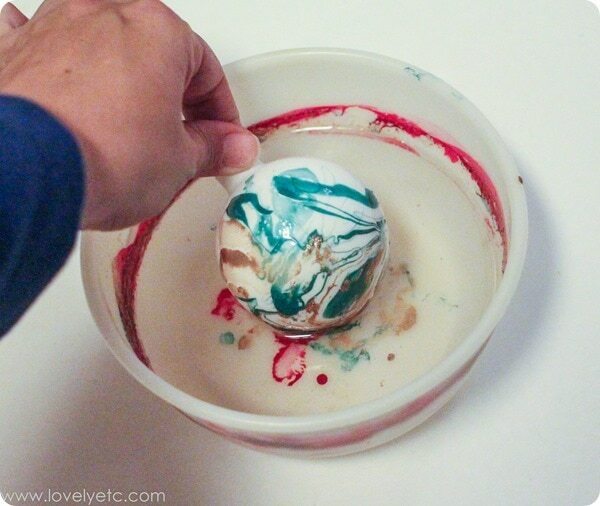 Less swirling makes more a of a watercolor type look, more swirling makes a marbled look. Then comes the magical part. 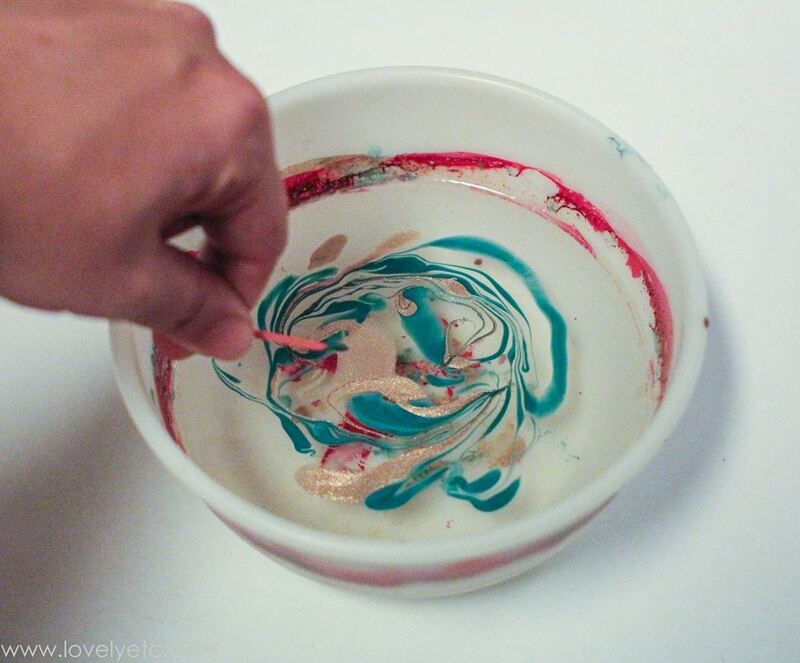 The nail polish all sticks together in a layer floating on top of the water. 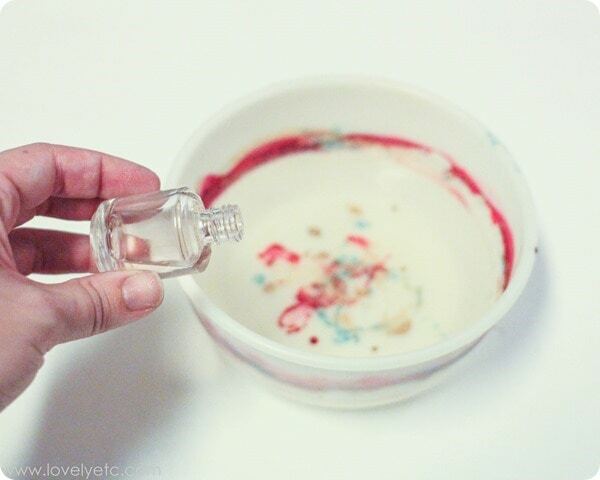 Carefully dip your ornament into the water and then pull it out smoothly. If you want to be really neat, you can hold the top of your ornament with needle nose pliers, but I just pinched the top of the ornament between two fingers because I had more control that way. When you pull the ornament out, the swirly nail polish will all have transferred to it. Lastly, this is very important! 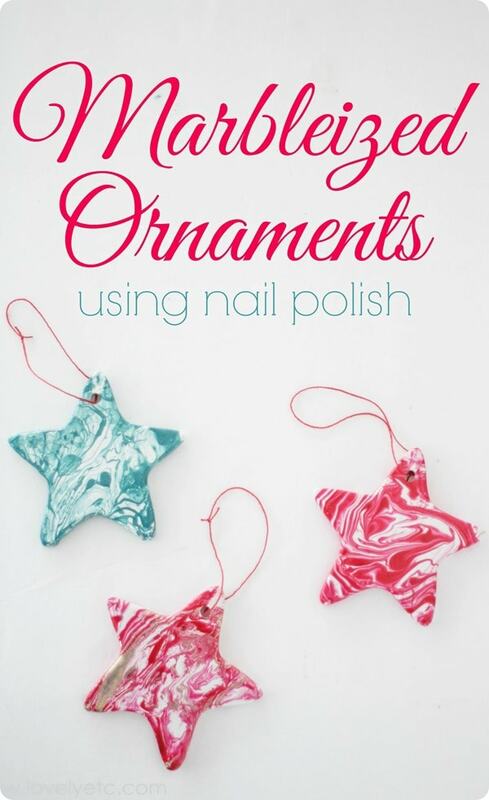 You need to clear any remaining nail polish from the water before doing the next ornament, especially if you are changing colors. This is super simple to do. 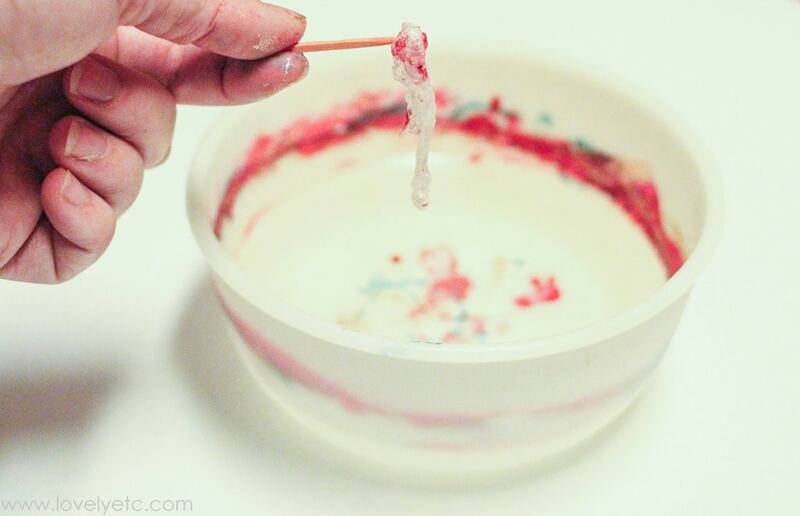 Dip a toothpick in the polish and swirl it around. The remaining polish will wrap around the toothpick in a cocoon-looking thing and then you can just throw it away. As I mentioned before, there are a few things you can do that will help you get better results. The gold nail polish I used did not work nearly as well as the other two colors I used. The color was beautiful, but it became stiff very quickly and did not swirl around the way the other colors did. I believe this is because it is a fast drying polish, but the sparkles in it could have also thrown things off. 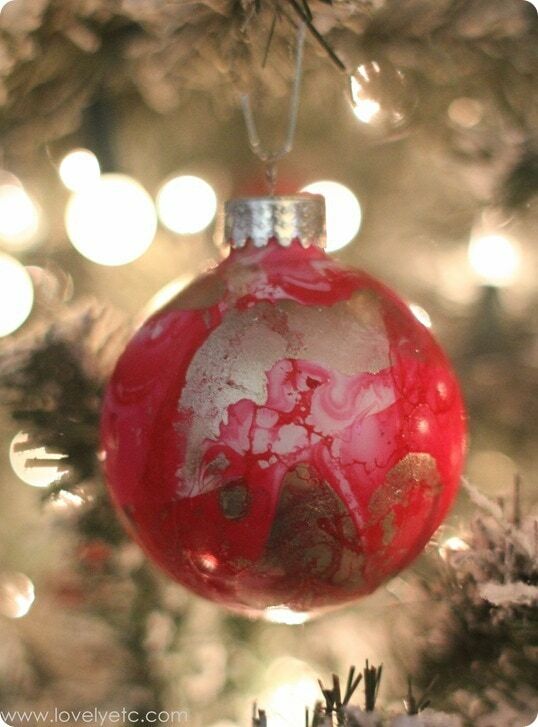 Originally I envisioned using all three colors together on the ornaments, but I found that using too many colors began to look busy and messy very quickly. I would recommend sticking with one, two at the most. 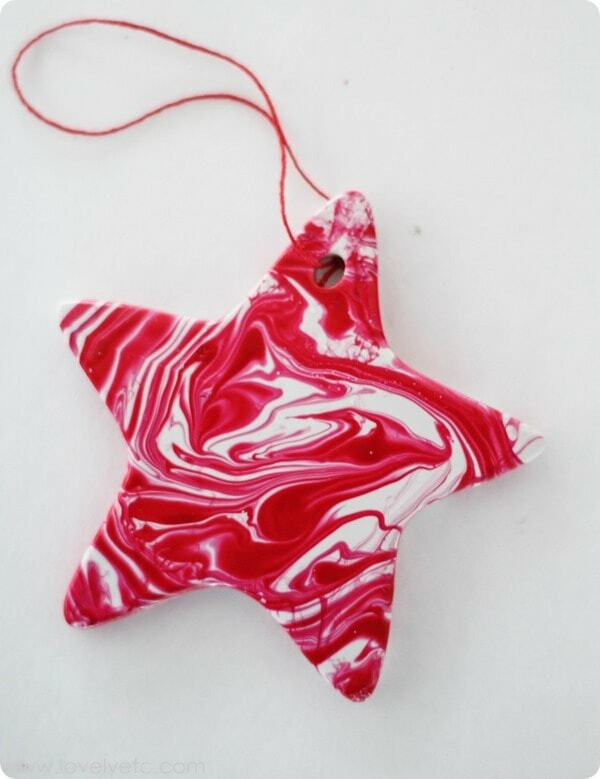 The picture below is an example of an ornament I did without using clear polish at all. As you can see, there is no white showing. 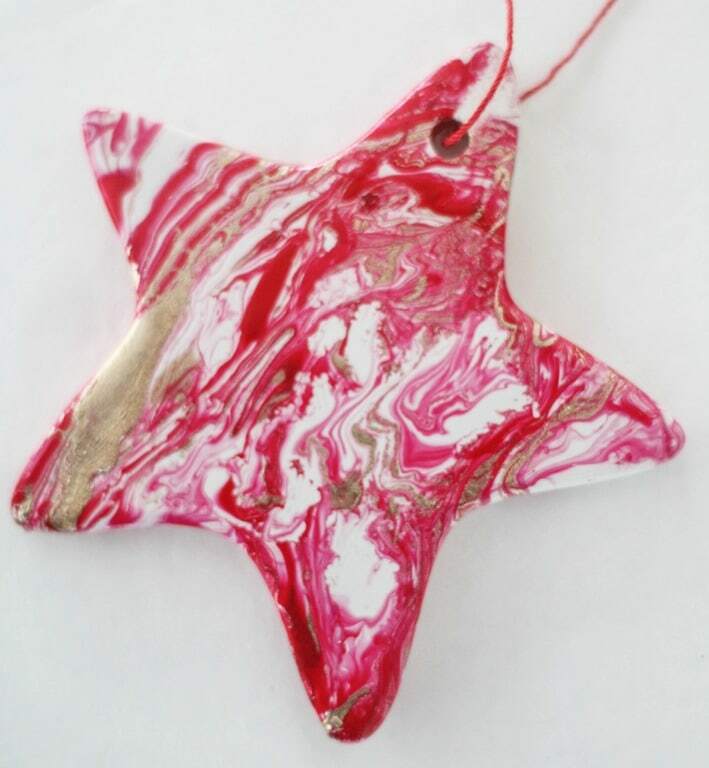 The red polish created a film that entirely coated the ornament and the gold just swirled with it a bit. While it was still pretty, this was not the look I was after. If this is the look you are going for, by all means, skip the clear base. 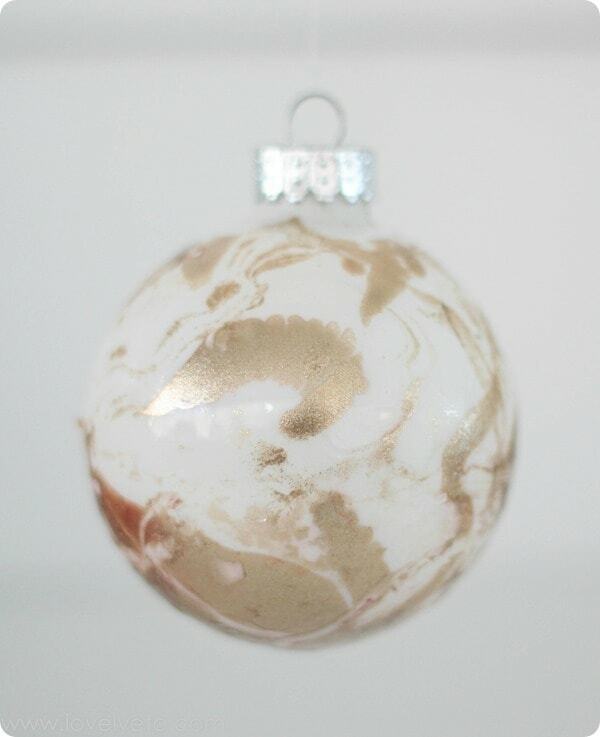 If you dip an ornament and then are not satisfied with how it looks, you can redo it. Let it dry and then repeat the whole process again. The finished surface might be a little less smooth in places because of the excess polish, but you can fix a lot of goofs this way. This aqua star looked really bare after the first dip, so I redid it and now it looks so much better. 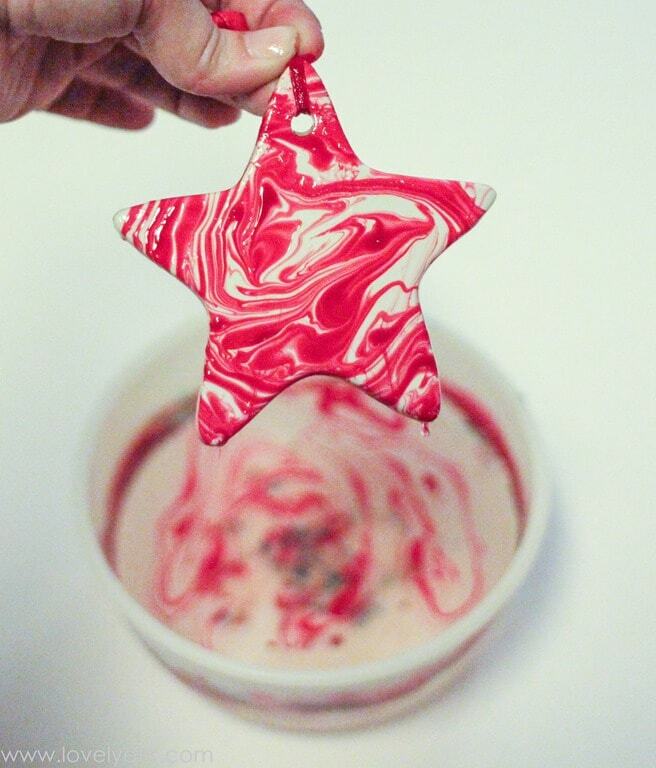 When you dip the ornaments, if the water and polish don’t quite cover the entire thing, you can swirl the ornament around a bit in the water until all of the sides are covered. Want more fun DIY ornament tutorials? You can see my whole collection here! Happy marbleizing! 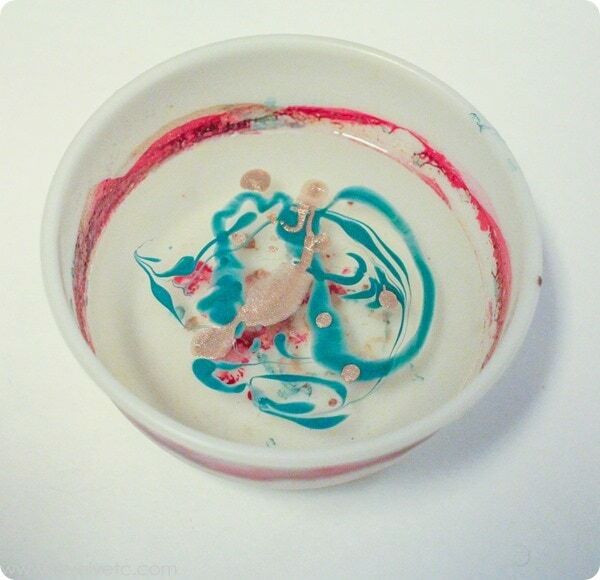 I have used the nail polish for coasters. The 1st two groups went well. Very defined lines. Then the polish started to fan out over the surface in a film. I cant get get defined lines again. I changed water, water temp, clean pans at each start. Nothing helps….any ideas?? Hi Jane, I’m sorry you are having trouble with the nail polish! Did you add clear nail polish to the water first? For me, that really made a huge difference. Also, I found that certain types of nail polish – in my case, quick drying – didn’t work as well. So that may also be something to check. Good luck!